Cosmetics and beauty chain Sephora may be able to look back at 2017 as a banner year for women’s perception of their brand – and they may have singer Rihanna to thank. Sephora, owned by French luxury conglomerate LVMH, was one of only three places where women could order Rihanna’s first Fenty Beauty product, a red lipstick that launched on Thanksgiving. Sephora made statistically significant gains with women in five key perception metrics over the first 11 months of 2017, a difficult feat in the current retail environment, according to YouGov BrandIndex. The first four metrics certainly are important for any company: Buzz ("If you've heard anything about the brand in the last two weeks, through advertising, news or word of mouth, was it positive or negative? "), Quality (“Is it high quality or low quality? "), Impression ("Do you have a general positive or negative feeling about the brand? "), and Word of Mouth ("Which of the following brands have you talked about with friends and family in the past two weeks, whether in person, online or through social media?"). However, it is the fifth metric that may prove Sephora’s mettle for the bottom line: Purchase Consideration, YouGov BrandIndex’s measurement of potential sales revenue. 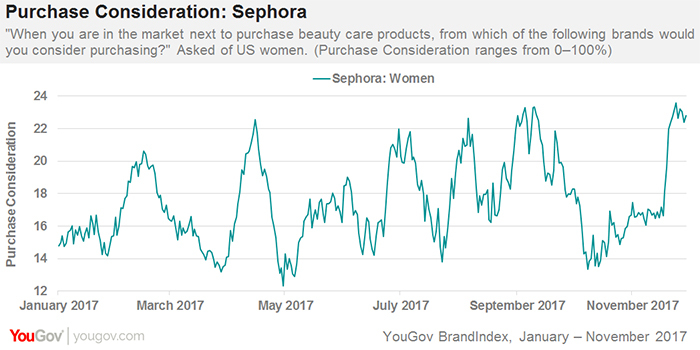 From January through November, the percentage of women who said they’d consider purchasing their next beauty or cosmetic product at Sephora rose from 15% up to 24%, the highest it’s been in over a year. That jump was one of the highest gains of the 1,600+ consumer brands that YouGov BrandIndex tracks. Sephora’s metrics made their largest moves late in the year, from October through November. 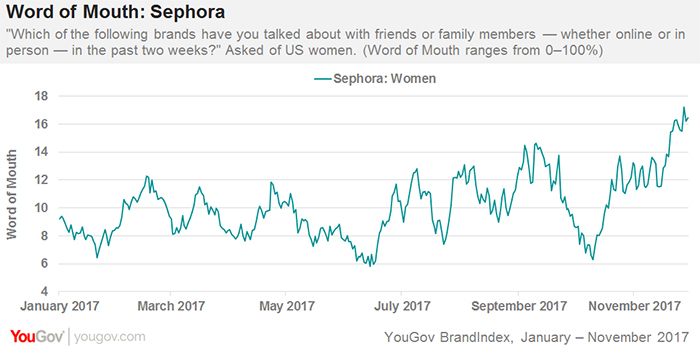 On November 27, 17% of women 18 and over talked about Sephora with family and friends (Word of Mouth), the highest it had been in 14 months. Even reports of a woman claiming she got herpes from a Sephora beauty sample in late October barely stalled the brand’s momentum. Sephora had many other promotions going on this year that may have contributed to the company’s successful metrics – a “Weekly Wow” deal that ran through late October, and tattooed beauty mogul Kat Von D’s announcement of new products to be rolled out in December.